Prepare for tonight's Prep and Landing! Happy first night of Hanukkah to all my Jewish friends out there! 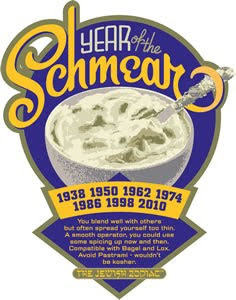 Tonight, I may just have to make some latkes (btw frozen hash browns are a great shortcut for these guys). In celebration of the festival of lights - here are some wonderful Hanukkah and Jewish-inspired items I found around the net. You may also want to check out my earlier post with DIY decorations for Hanukkah. Enjoy! Since there aren't that many great Hanukkah movies in existence. 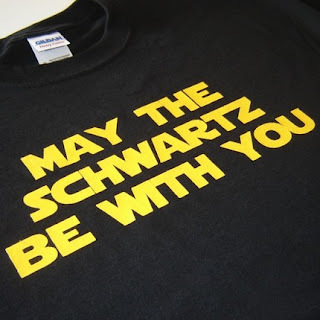 Why not pop in a Mel Brooks classic like Spaceballs while sporting a spiffy and witty shirt? Very swanky. Adam Sandler's classic, "The Hanukkah Song"
We have a small but awesome catalog of rockin Hanukkah songs. We may not get our own radio station at Christmas.. but we have this guy. And he's kinda famous. And he's a Jew. Wooooo! I spotted this last year - very DIY-oriented song. So many uses for Matzah that I never knew! Last but not least - I couldn't leave out the very festive (although not Hanukkah-specific) Muppets' version of "The Ringing of the Bells." Sorry folks, I'm just too Muppet-oriented not to include em. Here's a lovely, easy dinner recipe- Greek chicken with onions or as Kraft Foods originally titled it, "Grilled Greek Chicken Kabobs." As I was skewer-less and grill-less when I made it, I have nixed the kabob and the grilled parts. GRILL 8 to 10 min. or until chicken is done, turning occasionally. Meanwhile, place lemon, cut-sides down, on grill grate next to kabobs. Squeeze lemon juice over kabobs just before serving. SAUTE chicken on medium-high heat. Cook thoroughly. You may want to remove the excess water/marinade that forms as the chicken cooks. Add fresh lemon to the pan close to the end of cooking. In a separate pan, SAUTE the cut red onions with a little olive oil, salt, pepper, dash of lemon, and garlic. COMBINE chicken and onions when both are finished cooking and serve with sliced lemon. nom! And there you have it- short n sweet and dinner in a snap! Empty wine bottles. We all have them. Some of us have more than others and some of us awesomely prefer their's from a box. Whatever the case, an empty wine bottle is an awesome home decor item waiting to have its potential unlocked by you. With a little DIY know-how, you can skip the recycling bin and make an even greener, not mention, FREE project that will dazzle the masses. 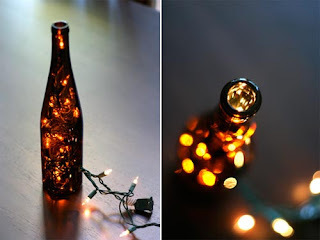 Below, find several excellent tutorials and inspiration for some very swank vino bottle projects. UPDATE - So my friend Rachel is super knowledgable and warns that this project could actually be very dangerous to your health. If you do this- use it only for decoration do NOT consume the olive oil as it could make you sick. From the article, "Give your kitchen Italian flair by filling clean empty wine bottles with olive oil and dried herbs such as basil, rosemary, or oregano. Toss in several peppercorns, dried garlic, or chilies if you like a spicier blend. 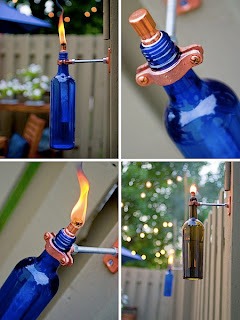 Keep a cork on the bottle and the wine bottle oil and herb blend can be kept just for decoration." 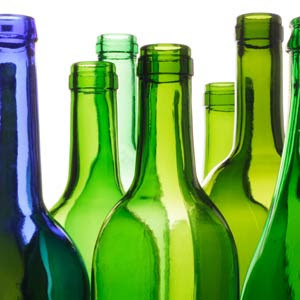 A fairly simple DIY Project - apparently the trick is using a specialized drill bit for drilling glass to create the hole in the bottom of the bottle. I also read on other sites that you should run over the spot you want to drill on with warm water to prevent the bottle cracking. Regardless- Gorg. Really ingenious DIY tutorial and only requires roughly $5 in supplies. Chic and super lovely. Too bad I don't have a real porch to showcase it. 10 Uses for the Corks! Tonight, at 8:30 pm EST/5:30 pm PST, ABC is airing Disney Animation's FIRST EVER Christmas special: Prep and Landing! Elf Yourself by Office Max - Most people have seen this since its hot debut last year. It's still hilarious to send and there are many different elf dances: everything from hip-hop to disco! That's it from me this morning. Hope you all love the special tonight!! 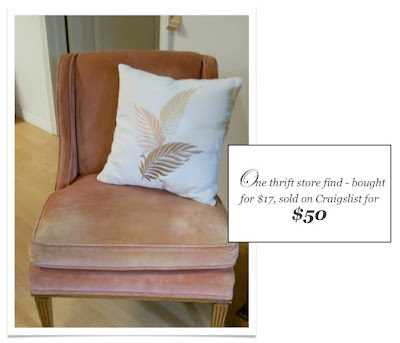 This weekend marks the first of two major home decorating successes for me: my first Craigslist sale and my first amazing trip to an LA garage sale! On Friday evening, I sold a chair that I got at the thrift store last year and had planned to recover. I'd never quite gotten around to doing it and then learned how much it might cost to get it done! Yeesh. So, the chair I originally purchased for $17, I managed to successfully sell on Craigslist for $50! With the bills still warm in my wallet, I set out to my first garage sale out here on Saturday morning - hoping to find something I was in need of - nightstands. Alas, I didn't find what I was looking for but instead, some unexpected treasures! I did so well at the first one - I stopped by another on the way home and it yet another jackpot. This my friends is the equation of how one chair became so much more in the span of 24 hours. I'm still coming off my good deal euphoria so bare with me. 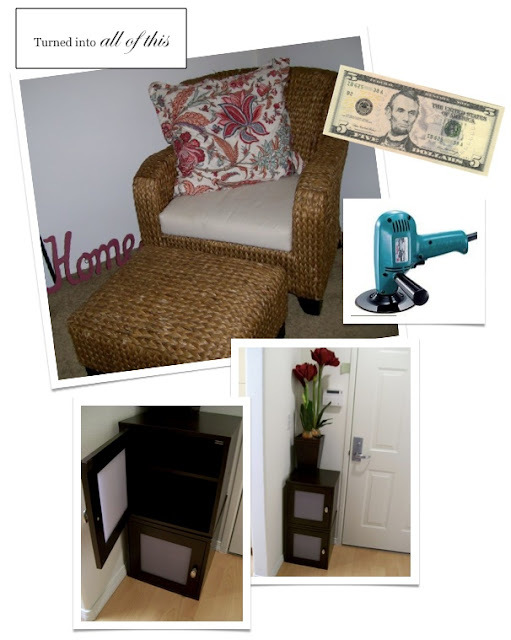 So for one chair - I got ANOTHER chair (plus ottoman) for $30, an electric sander for $10, two faux dark wood cubies with drawers for $5 together, AND had $5 to spare. Huzzah! While I'm totally psyched to have that lovely chair in my bedroom (doesn't it look snazzy with my Pottery Barn bed pillow chillin on it?) - no more chairs! My 700 sq. ft haven is starting to be like that scene in Knocked Up where Paul Rudd freaks out because there are five different types of chairs in the hotel room. Currently, I have five different types of chairs. I am selling my bar stools so hopefully that'll be down to four soon. I'm also considering a wicker embargo as I now have 3 different types of wicker chairs in the place. I like it as much as the next gal, but time to stop.